Leading Manufacturer of round head solid rivet and flat head solid rivets from Ahmedabad. We are one of the eminent providers of Round Head Solid Rivet. These are manufactured with the help of high-grade material. These Rivets do not need the help of any Riveting gun. We provide the customized production facility as per the client’s requirement. Flat Head Solid Rivets are available in a wide range and caters to the need of many industries. The raw material used in the manufacturing of these Rivets is procured from trusted vendors. 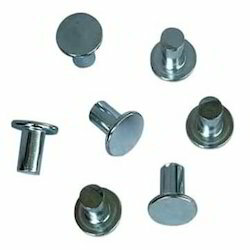 We offer these Rivets in the customized specifications to the clients.